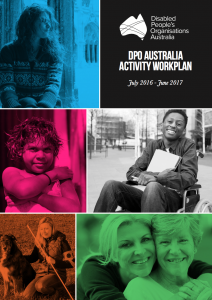 The DPO Australia Activity Work Plan builds on the work plan agreed by the member organisations of the Australian Cross Disability Alliance (ACDA) in June 2015, and reflects the transition of the ACDA to DPO Australia. The Activity Work Plan is premised on the key work that is required by Department of Social Services (DSS) as well as the key work that DPO Australia has identified as critical to progressing the rights of people with disability in Australia. Critically, this Activity Work Plan is underpinned by the internationally shared values and purpose of Disabled Peoples Organisations (DPOs). DPOs are governed by, led by and constituted of people with disability, and collectively form a disability rights movement that places people with disability at the centre of decision-making in all aspects of our lives. This is known internationally through the motto, “Nothing About Us, Without Us”.